DEALING WITH THE CHALLENGE OF HOLDING RUNNERS. Often when there is a runner on first, we are concerned about them stealing second. We try picking them off and the next thing we know we've handed them the next base without making them earn it. Or worse, the overthrow gets down the right field line and the runner advances to third on the play. Success in baseball is often a matter of minimizing mistakes. At the youth level of play, in can be argued, the result of the majority of games is not that the winning team 'won' the game, but rather the losing team 'lost' the game ...by making too many mistakes ...many of which are self inflicted. 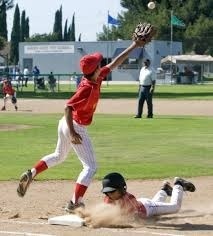 A place where losing teams self-inflict many mistakes is attempted pick-off throws. The flip side to this situation is, many teams that win at the youth level, where lead-offs and stealing are just being introduced, do so by keeping the opposing team from running wild on the bases. ...how do they do it? First, they teach their pitchers and players a proper mindset for making throws to first (and bases occupied by runners in general). Then, with that mindset established, they practice throws to bases using fundamentally sound techniques. Think of what we commonly call the throw to first base: “Pick-off Move”. That long used phrase has morphed into the mindset that the purpose of this play is to generate an out – pick the base runner off first. Too often this results in a pitcher trying too hard to ‘pick the guy off’ and firing the ball past the first baseman. Let’s ask ourselves the question, “what is the objective of throwing over to first base?” Are we really trying to generate an out? …or perhaps are we simply trying to ‘Hold the runner close’? …or disrupt their timing? …or to wear them down and slow their jump? …or create anxiety by sticking in their mind that, ‘Yes, the pitcher Will throw over’? When I was a head coach in college we changed the phrase ‘Pick Move’ to ‘HOLD Move’. Our objective was to re-set our pitchers’ mindset when they threw to first base. We taught them that we are not trying to ‘Pick the Runner Off’, we are working to ‘Hold Them Close’. 1. What percentage of throws to first base result in an out? I don’t have any stats, but I’ll suggest the number is less than 5%. 2. At the amateur/teen level of play, what is the percentage of balls thrown past the first baseman? …I don’t have a stat on that either, but I will suggest that the percentage of balls thrown past the first baseman is higher than the percentage of throws that result in an out. We taught our college pitchers to throw to first base at the first baseman’s belt level, not low to the ground, near the bag. By practicing with this mindset, our pitchers became very good at confidently making catchable throws. When a base-stealer is Picked Off, was it a result of the pitcher making a quick and awesome throw, or was it a result of the Runner ‘Getting Themself Out’? ie, they were ‘leaning’, or their first move was towards second base when the pitcher threw over and as a result they were late in getting back to the base? We told out college pitchers, “Make consistently good, catchable throws to first base and give the base runner the opportunity to ‘get themselves out’”. Given this new mindset, our pitchers learned to coolly and confidently throw over to first more frequently. The more we threw to first, the greater the chances of the runner making a mistake and ‘getting their self out’. …no we didn’t throw over a zillion times each game ;) but we wouldn’t hesitate to make back to back throws to first in base stealing situations and counts. We did not keep stats on this, so I can’t say it produced more outs, but the occurrence of ‘throwing the ball away’ was very low. Making consistent quality throws, for any position and most throwing sports for that matter, is based on good Footwork. The process for teaching and training pitchers to throw consistently well to first base begins with Training proper footwork. Pitcher comes to the set position, then makes a 90 degree turn (very low two footed hop) in the direction of their glove side. In the process they separate their hands and bring their elbows up to shoulder height to a throwing (power) position. At the end of the action, we want their feet to be wider than shoulder width and be able to draw a straight line from the tip of their right foot, through the tip of their left foot, to first base. The line from their back elbow, through their shoulders, to their left elbow also needs to be straight towards first base. More than likely the pitcher’s feet and elbows/shoulders will not be lined up properly in their first try and likely not in many subsequent tries. The purpose of the drill is to train this action, so the pitcher is in a good throwing position and lined up properly to throw to first base, each time they execute the action…this is more than a one day process. NOTE: this drill does not need to be done on the pitcher’s mound. It can be done along one of the foul lines in the outfield (leaving the infield area for position players to work). Also, it can be done simultaneously be your entire pitching staff. This action is executed over and over with the pitchers and coach checking their body alignment after each repetition. – Do ten reps of the action. After doing this ten times without a ball, add the ball to the action, so the pitcher is finishing in a proper throwing position. – Ten reps using a ball. Establish a good percentage of quality throws before moving on to Step 4. If time allows, do not advance to Step 4 on your first day of work. Ideally we hold off on step 4 till our third workout. NOTE: a key to throwing accurately from this distance is putting greater emphasis on the wrist snap and bit less emphasis on the arm generating the power behind the throw. It is critical that throughout the process we are constantly working to establish the mindset that our pitchers are developing their ‘Hold Move’, not a ‘pick-off move’. We must monitor the pace of their actions. Kids naturally want to show how good they are at physical skills; they will try to go too fast, too soon. We Will have to remind them to work at a Controlled pace and explain to them that First they need to develop the muscle memory of the actions. Then, after they have demonstrated consistency in executing the actions, we can start to speed things up …on days 3, 4 and beyond. Our objective is, by the end of the second workout, that the players develop some level of mastery of the actions and have been successful in making fairly accurate, catchable throws to ‘first base’. On subsequent days of work, based on our observations, we direct the players to increase the speed of their actions bit by bit. It is likely that we will not reach full speed in the actions until Day 4 or 5. The progression of the group depends a lot on their age, how quickly they grasp the concept that they are not trying to pick the runner off and their level of focus and commitment to learning. Once our pitchers learn the steps, we can shorten the reps to five of each and knock it out in a few minutes. Given that the workout doesn't take long, we can incorporate it into our daily pre-game work. As time moves on, the action of making solid, accurate throws to first base becomes second nature ...and executing this action in games becomes routine. Accomplished base stealers are constantly observing pitchers, looking for cues and patterns in order to gain an advantage. The simplest and most obvious pattern to detect in a pitcher is the guy who never throws over to first base twice in a row. At the youth level and the lower levels of the amateur ranks the vast majority of pitchers only throw over to first base one time before delivering the next pitch. After a throw over, the base runner knows the pitchers next action is going to be to deliver a pitch. They can extend their lead a bit, lean a bit towards second and their anxiety level (concern of being picked off) is diminished a great deal. Being in a much more relaxed state allows them to stay lose, get a better jump and perform better in their dash to second base. Given the above training we put our pitchers and players through, along with the 'Hold Move' mindset we've instilled, we can now have a pitcher throw over to first base twice in a row with confidence. Sometimes we even throw over three times. By demonstrating to our opponent that we will throw over multiple times in a row, the runner now has to stay on high alert at all times. Also, taking a lead and diving back in the dirt multiple times tires a runner. A tired runner with a heightened level of anxiety is less likely to try to steal, or be successful when they try. The first runner who gets on base in a game (unless they are obviously not a base-stealing threat), we want to demonstrate to our opponent that we will throw over to first base multiple times in a row. As the game progresses throw over back-to-back times now and again to maintain the level of doubt in the other team's runners. When a player gets on who we know is very likely to steal, we throw over three times. We don't want to do this for no reason or make it a constant, but throwing over three times in a row a couple times a game can really demoralize our opponents base runners. If you have ever attended a college or pro game where the pitcher from the visiting team throws over to first base multiple times, what happens? The crowd Boooos. Many just want for the game to move along. Others understand exactly what the pitcher is doing, and by booing they put pressure on the pitcher. At the youth level, our kids aren't playing in front of large booing crowds. They are however, playing in front of the adult parents of the opposing team and the adult coaches of the other team. When your pitcher throws over to first base two or three times and has done so against multiple runners, it won't be long until one, or many, of those adults will fire an unhappy statement towards your pitcher. Even the most talented and confident kids is subject to feeling intimidated by an older, larger adult. The pro pitchers can handle this sort of pressure. For kids. on the other hand, such comments can be very unnerving. During the process of training our pitchers and players to confidently and effectively throw to bases occupied by a runner, it is absolutely critical that during that training we prepare them for the reaction they will get from the adults on the opposing side. We want to be point blank about the fact that initially it might be a bit intimidating and they might want to stop throwing over to avoid the pressure ...and hearing the disdainful tone of the comments their way. 2. If the coach (or base runners) of the other team doesn't want us throwing over so much, they have the option to shorten their leads. If they want to lead off, they are inviting a throw over. Its their choice. 3. Most importantly, we teach our kids to flip the situation and react to in a positive manner. Rather than hearing the adult comments as a negative towards their throwing over, we instill in our pitchers that they have gained the upper hand. Those adults are frustrated because that little kid on the mound is controlling of the running game. And they recognize the control that kid is commanding is diminishing the chances of their team to succeed. ....the more the adults on the other side bark, the bigger the smile on our pitcher's face and the greater the assurance that they are addressing the situation the right way.